Thought I would do a run down of the best Magazine freebies and beauty bargains as there's some good ones this month! Buy online from today Wed 7th March at Boots (free delivery if you get it delivered to store to pick up) until Tues 20th March 2012. Would make a brilliant Mothers Day gift? The set includes: Watermint Shower Gel (£6); Watermint Lotion Spritz (£7); Hand & Nail Cream (£9); Gentle Facial Polish (£14) and Replenishing Moisture Mask (£10). Buy the April edition of Marie Claire Magazine (£3.70) with Christina Ricci on the cover and you'll find a free 45ml Rehydrating Rose Daily Moisture from Neal's Yard worth £12. Buy the April edition of Glamour Magazine (£2) with Jennifer Lawrence on the cover and you will receive a free hair treat from Percy & Reed! You can choose from Percy & Reed Splendidly Silky Shampoo (worth £5.60); Percy & Reed Splendidly Silky Conditioner (worth £6.40); Percy & Reed Quite Frankly Flawless Finishing polish; or Percy & Reed totally TLC hydrating mask (worth £11.42). Buy the April edition of Cosmopolitan Magazine (£3.50) with Holly Willoughby on the cover and find a free Clinique mini product. You can choose from the following: 7 day Scrub Cream (worth £5.25); Superbalm Moisturising gloss (worth £6.30); High Impact Mascara (worth £8) or Moisture Surge Thirst Relief (worth £18). 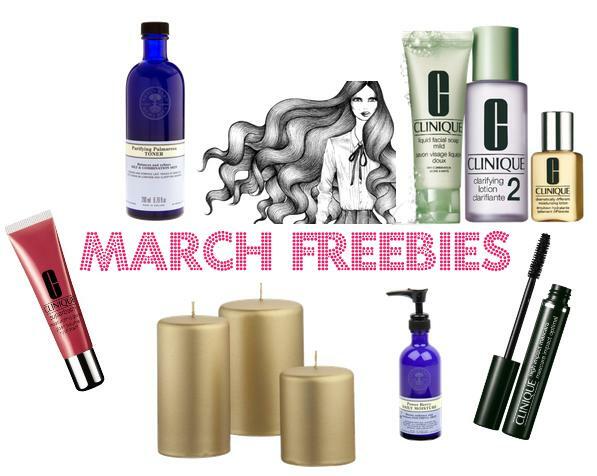 Have you found any good freebies this month? magazines are having such good freebees lately! I'm glad good magazine freebies are back! I got the Percy & Reed shampoo and conditionner from Glamour! I think I'm getting the hair care, looks really good. I think I'll try to find Cosmo (I love Holly and Clinique so double bonus) or Glamour as my friend got that and loves her free product!